The Flagstaff 2 DRAWER LATERAL FILE by Winners Only at Crowley Furniture & Mattress in the Kansas City Area: Liberty and Lee's Summit, MO & Overland Park, KS area. Product availability may vary. Contact us for the most current availability on this product. Make your bedroom a sanctuary with the Flagstaff collection. Each piece of this collection uses a panel design that will give your bedroom a consistent look while also conveying a transitional style. 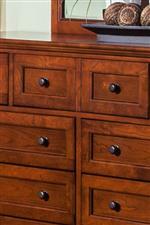 Each storage piece will give you plenty of bedroom storage and has English Dovetailed drawer construction. Featuring tapered feet and molding throughout each of the pieces you will be sure to enjoy the simplicity of the collection. 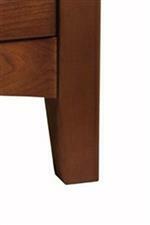 Available in Mission Cherry and Espresso finish. The Flagstaff collection is a great option if you are looking for Transitional furniture in the Kansas City Area: Liberty and Lee's Summit, MO & Overland Park, KS area. Browse other items in the Flagstaff collection from Crowley Furniture & Mattress in the Kansas City Area: Liberty and Lee's Summit, MO & Overland Park, KS area.